No more apologies! My apologizing for 'not producing' days are over. I am back in the swing. 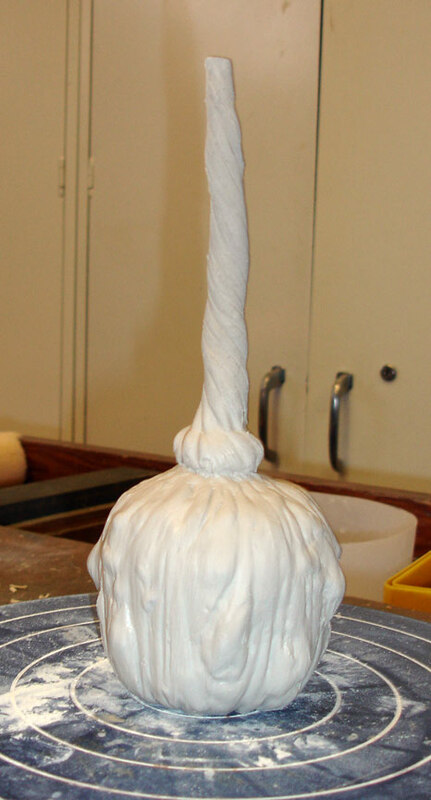 I have hardly touched clay this summer because of a money making endeavor- which has yet to pay off, but it will. So, what have I been up to? In June the family took off to the beach in New England- stopping off in DC on the way so son Chris would see the capital before he starts school. He will be a boarding freshman at St. Louis University. We will miss his presence at home. But he is close by! 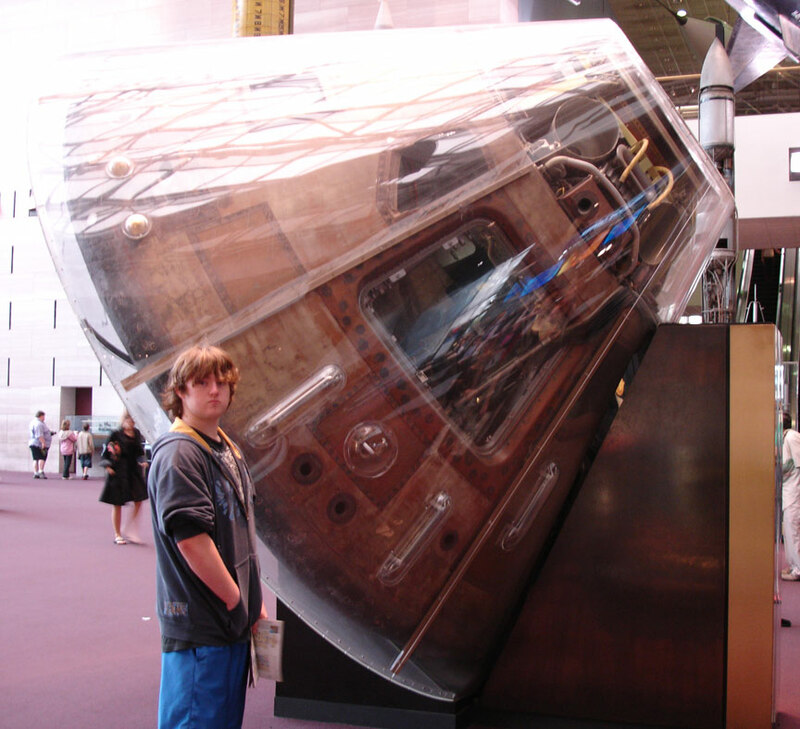 He is pictured at the Air and Space Museum next to the original Apollo 11 capsule. and I posted a number of gourds. 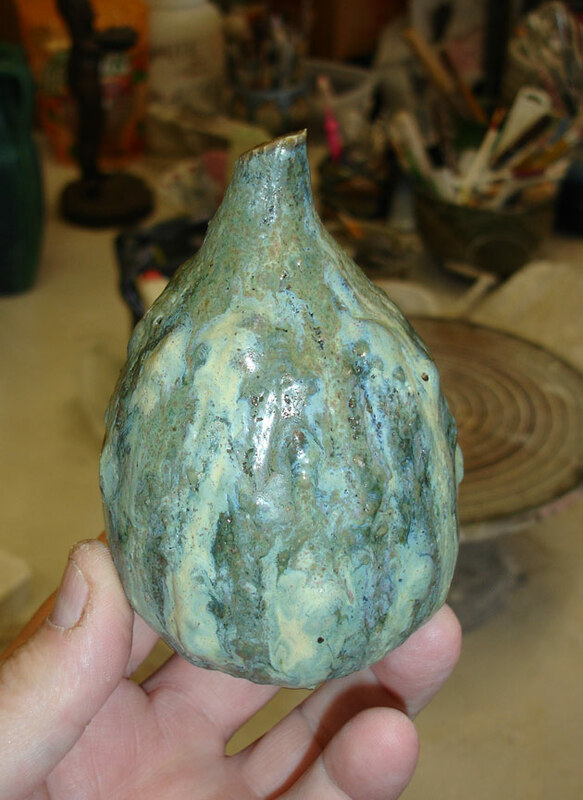 I do enjoy making gourd- as you will see further down the page. 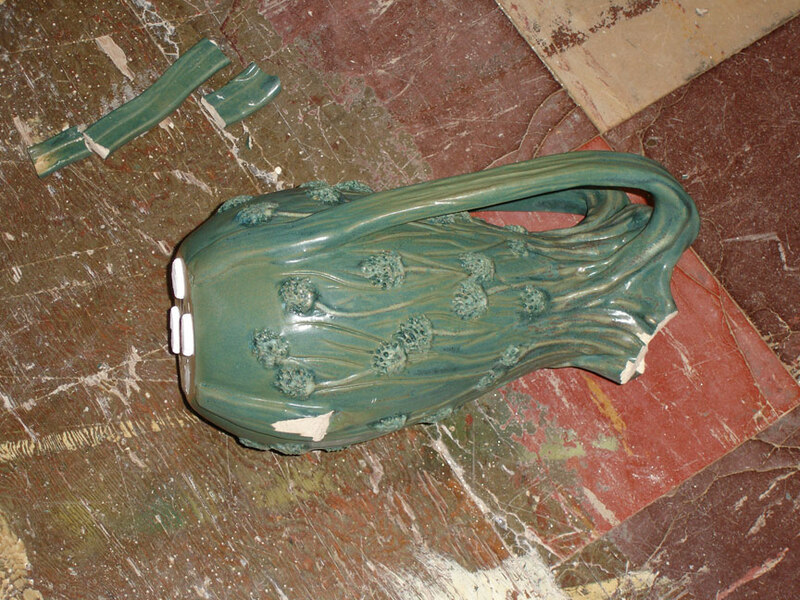 This big loopy four handed pot ran into a problem. Or maybe I should say "a problem" ran into it! My cat got this one. "Pinky" has never been a problem in the studio and I have to admit that the fault was as much mine because of where I placed the pot. It was right in front of a cat path- a path where the cat has to jump to get to his destination. The pot was on a rolling table and I suspect the cat jumped and either nudged the pot or shook the table. Probably it was both. Ah, it happens. It literally does not bother me at all. And then Tim and Donna Miller from Ohio stopped by. 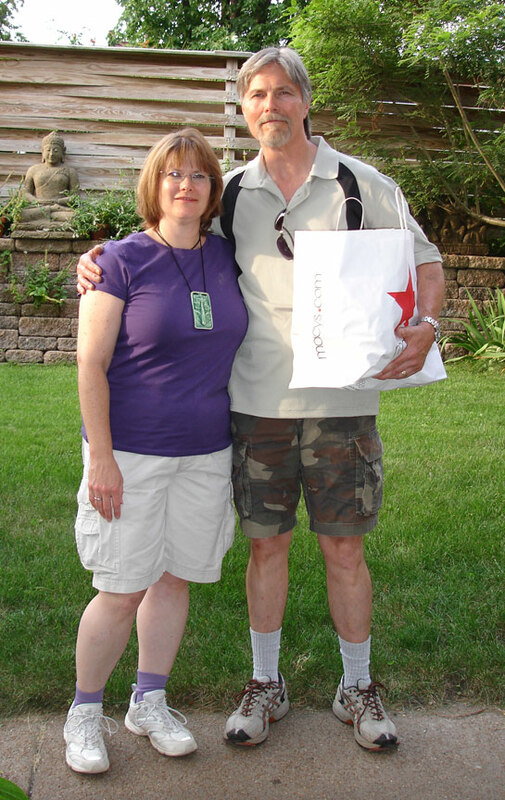 They were coming to visit St. Louis- with their son Daniel- for four days and we ran around the City one afternoon. 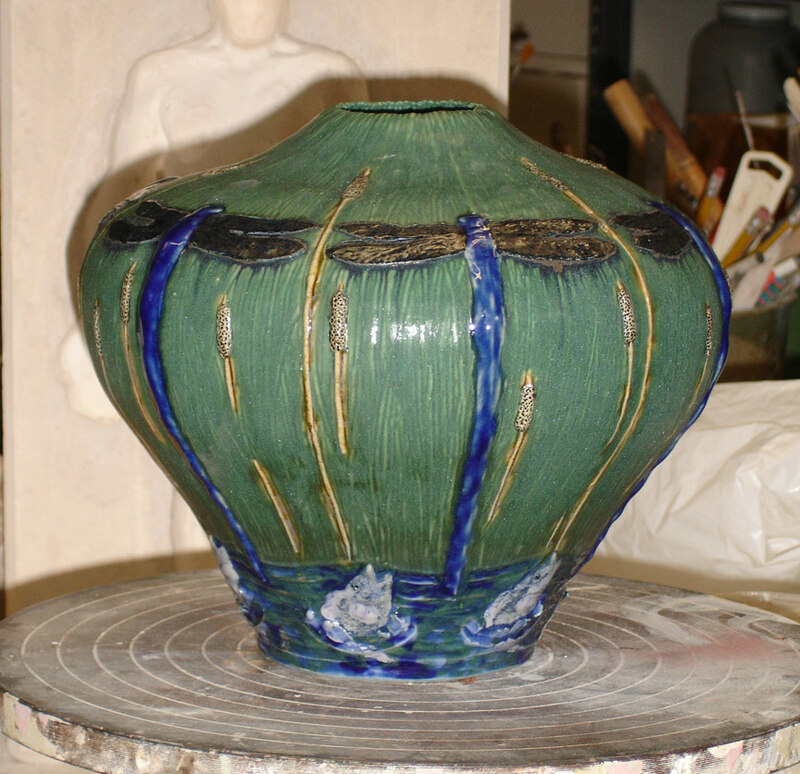 It was fun and good to see Tim- a regular at the Ohio Pottery Lovers- and Donna. Wish they lived closer. And speaking of Ohio, I found this wonderful Zanesville oil jar in a St. Louis shop for 10 bucks. Made my day. I have not bought any old pottery in ages- most of my purchases are new pots in the Mingei tradition. 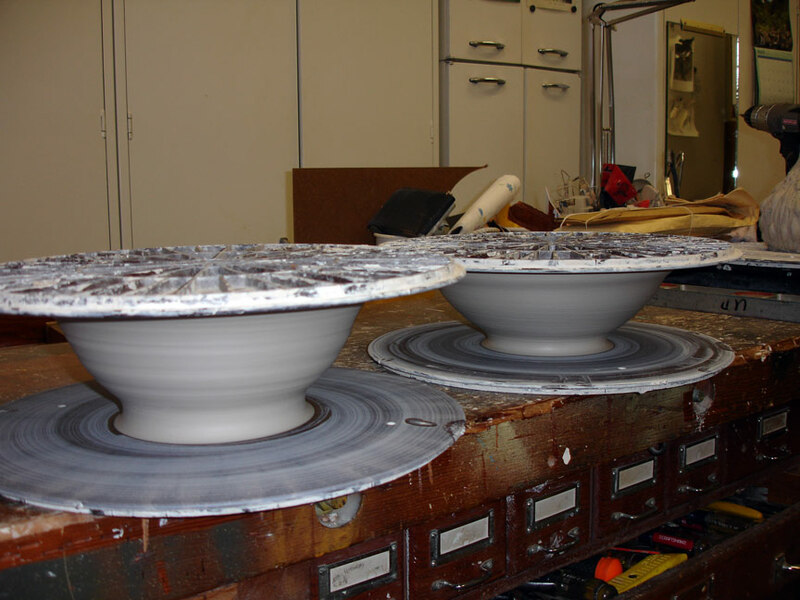 In fact, seconds ago as I was writing this, I had to divert to Paypal to pay for two of this guys pots that I won on ebay. Anyway I bought this oil jar that is either Robinson, Zanesville Stoneware or Burley and was amazed to see that it was a copper red reduction glaze. 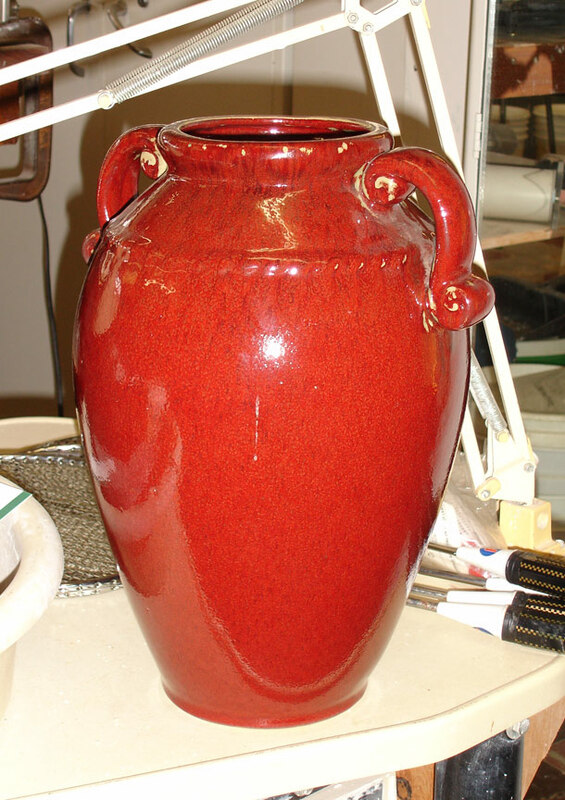 I have never noticed a copper red production pot from any of the Zanesville potteries and I have looked at a LOT of Zanesville production pottery. 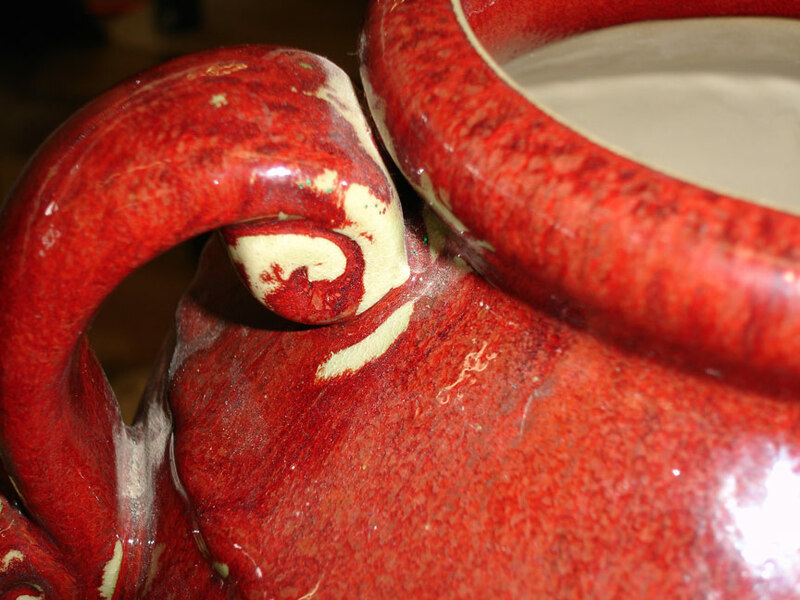 FYI, you can id the glaze as a copper red because of the way the glaze breaks around the handle and did not go red. 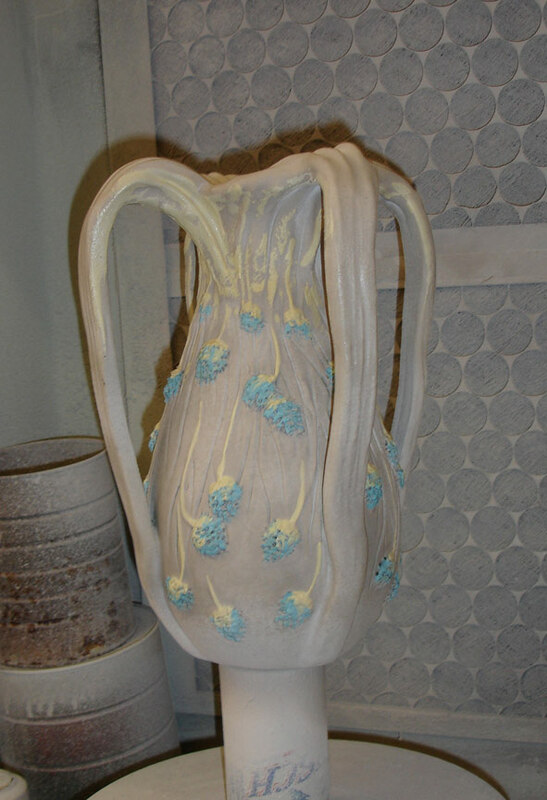 The atmosphere in the kiln determines if the pot will go red or the pale clear white/green you see below. It is a tricky way to fire. Anyway, I thought I would show you this wonderful pot. It is in my front hallway with all my floor pots. Also, I dug this out of my collection. 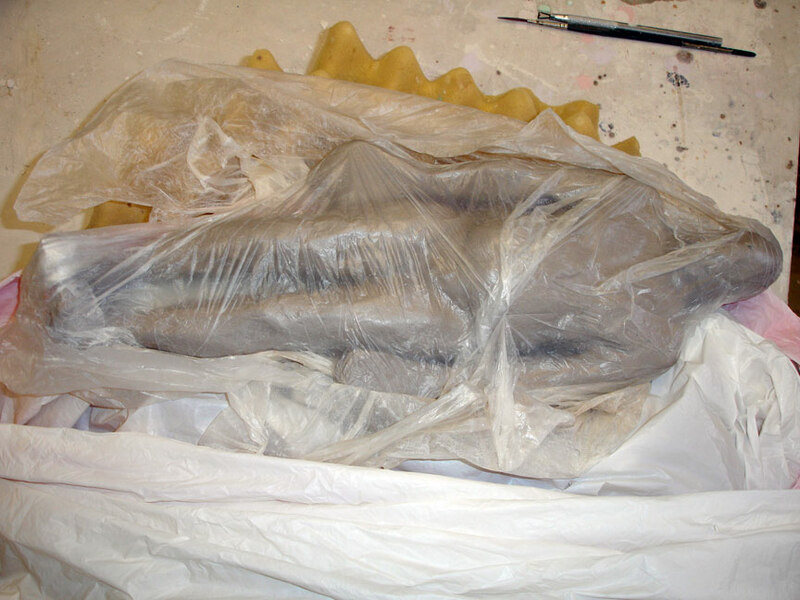 It is a big and heavy slab piece by David Hersery. 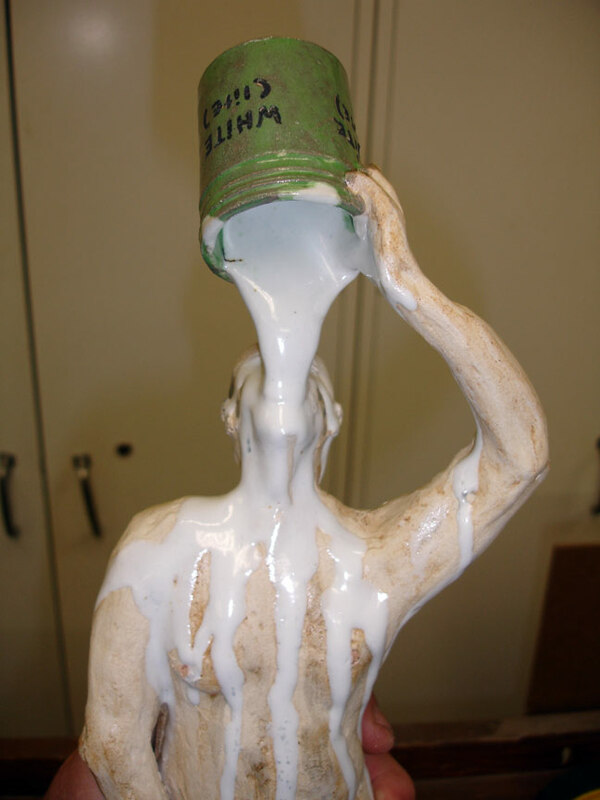 He is a St. Louis potter that defected to glass about 20 years ago. Here is one of the figures I am working on. When I look at this photo, I understand why Christo likes to wrap things. 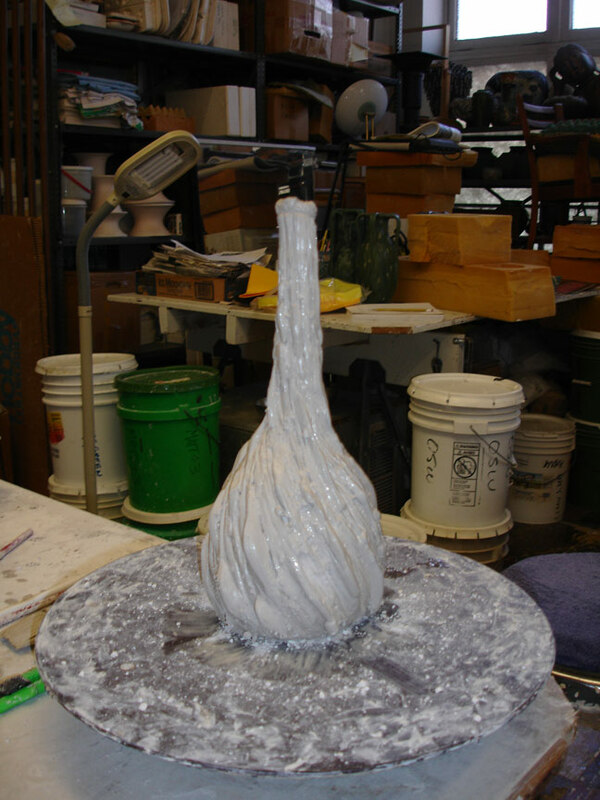 Pictured here is a recent figure that is glazed and waiting to go into the kiln. This was a tough one to make. I am making these figures on a regular basis. The one I am currently working on is going to be stunning. This is me as a prism of the world. I drink in the white light and produce color. 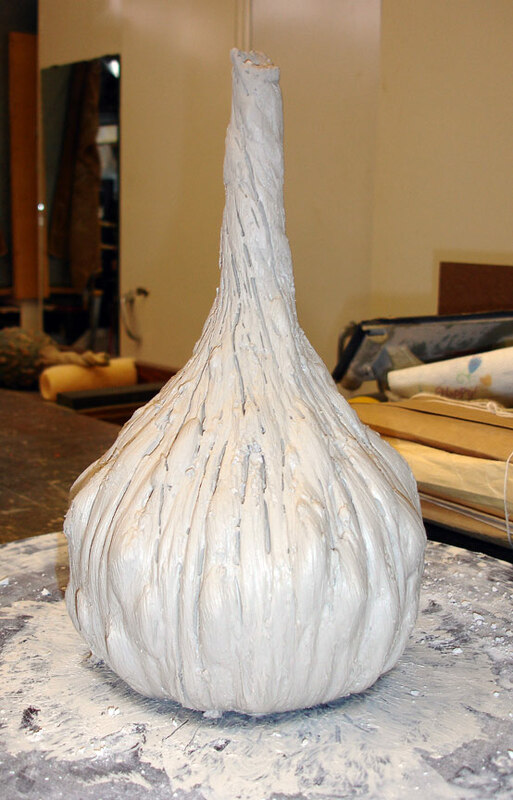 It is actually titled "I am Glaze". Here is one I made yesterday that has taken my off on a new tangent. 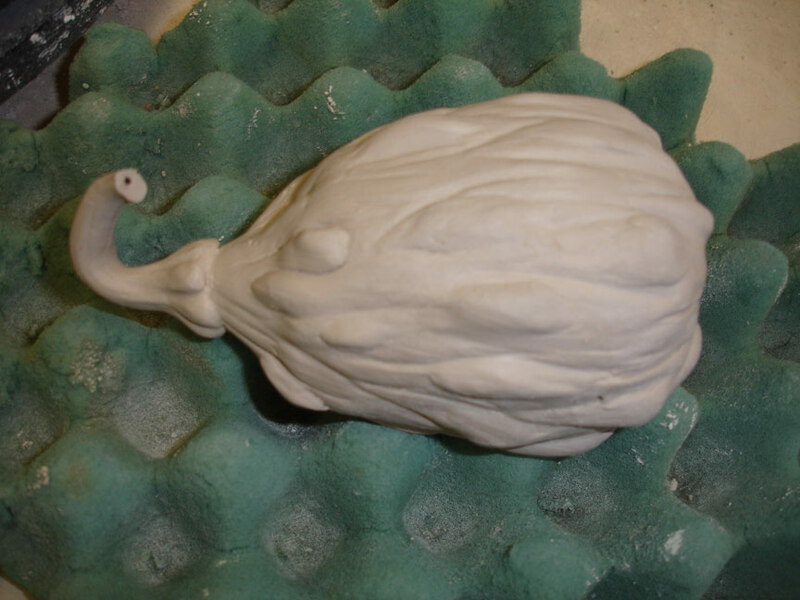 I call it a "narwhal gourd".